The poster cover for Railtrack’s next Annual Report (1997/98) joined its predecessor on the office wall. This time, the design cleverly blended photography and poster art in which one type blended seamlessly into the other. 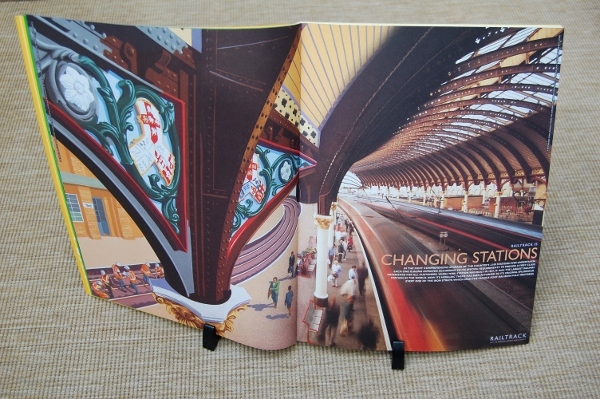 Artist Andrew Davidson must have impressed Railtrack with his “Working in ‘STEP'” illustration in the 1996/97 Annual Report, because this time he was awarded the commission for the graphic design of all six illustrations in the report (five double page spreads plus the poster cover), on the theme of “Transformation”. Davidson’s illustrations are beautiful and often highly intricate pieces of art, and he works in a range of media moving between woodcuts, wood engravings and gouache paintings. Apart from Railtrack, other transport-related work he’s undertaken includes a book for Cunard about Queen Mary and the design of the Intercity Pullman logo. He was paired with photographer David Partner who provided the photographic elements used in each spread. Partner has undertaken a lot of work in the field of infrastructure photography (check out his wonderful nuclear power station photos in this gallery). He has a knack for capturing dramatic viewpoints which made him ideal for the work in Railtrack’s 1997/98 Annual Report. As you can see, Davidson’s illustration on the left blends into Partner’s photograph on the right. As so often, vintage railway posters helped provide the inspiration for the poster. Railway artist Terence Cuneo’s “Track Laying By Night” poster (see it in the National Railway Museum’s collection here) was the earlier example this time. 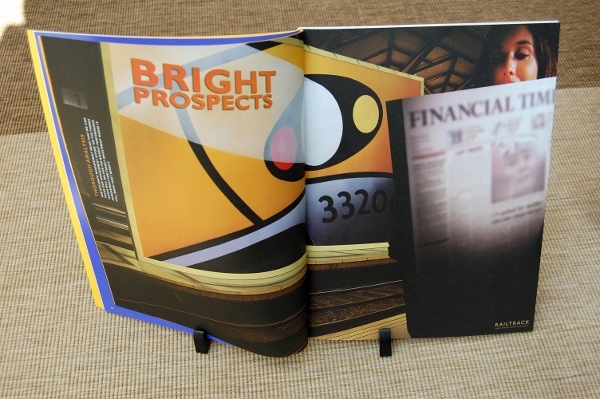 Inside the annual report, further blended photo/poster works illustrated Railtrack’s key achievements. Here, for instance, is Railtrack explaining its work in restoring Britain’s great railway station heritage, with the rather fabulous spandrels at York getting the Davidson treatment, blending in to Partner’s photograph of GNER and Virgin trains moving off. Other illustrations in the report detailed the trial of the Train Protection and Warning System (TPWS), Railtrack’s work on bridge renewals and repairs (using the Forth Rail Bridge as the subject, again featured decades earlier on a Cuneo British Railways Poster), and reducing infrastructure-related delays. 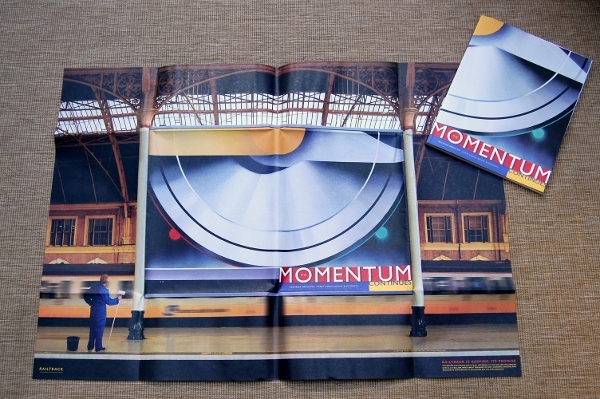 For this annual report, painted posters were positioned as billboards appearing within (staged) photographs. Again, all terribly clever, and probably easier to show than explain. “The Momentum Continues” explained that Railtrack’s investment programme would “provide the nation with a network fit for the new millennium”. Ironically, the photograph within which the billboard is displayed features an antiquated slam door train. This (presumably unintentionally) rather more accurately represented the reality of train travel for millions of London and south east commuters than Railtrack’s grandiose aspirations, and such trains would remain a familiar sight several years into the 2000s. Once again, Andrew Davidson was selected to provide all six paintings for report (one for the cover, five double page spreads inside). They are his most abstract works for Railtrack, beautiful bold images generally concentrating on details from railway operation rather than wider views. Photography on the picture spreads was again handled by David Partner, this time with human subjects often to the fore. Inside the report, the five double page illustrations once again detailed Railtrack’s key achievements, including how measurement of key performance indicators was allowing it to make investment decisions with the biggest payback. Davidson’s bold treatment of a headlight detail from a Heathrow Express train is quite wonderful, while Partner’s FT-reading executive is the perfect accompaniment, together transcending a snooze-inducing topic. The momentum might have been continuing as far as Railtrack and the front cover of its annual report was concerned, but in the real world it was about to come to a screeching halt in a manner that exposed serious questions about the company’s competence. In October 1999, the Ladbroke Grove train crash near Paddington station in London killed 31 people. Although its direct cause was a Thames Turbo train being driven through a red signal, Railtrack was strongly censured by the subsequent public inquiry for not ensuring the signal’s easy visibility when electrification works were carried out around it, and failing to review the signal after eight earlier incidents of it showing a red signal but train drivers passing it. 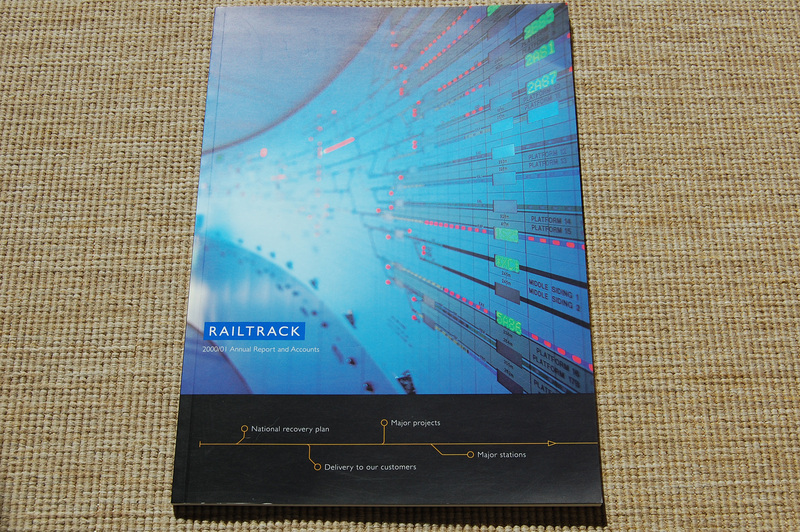 Now, suddenly, the 1999/2000 Railtrack Annual Report was a sober, plain affair, designed and produced by corporate reporting firm Pauffley. It was decisively different in presentation from the flamboyant reports overseen by Stocks Austin Sice. The cover was dark blue and there were no artistic interpretations inside of Railtrack’s biggest achievements that year. They had all been overshadowed by its evident safety failings. This was a company that knew it had been caught out, and caught out badly, and its annual report is a startlingly contrite piece of design compared to its predecessors. Now was the time to appear sober, humble and responsible, rather than flashy and bombastic. You’ll notice that the first descriptive term in Railtrack’s vision for the railway is that it be a “safe” one. Things, however, were about to get a whole lot worse for Railtrack. Whatever public confidence was left in its safety management was about to suffer a final, knockout, blow. On 17 October 2000, a GNER train derailed at Hatfield. A rail had shattered underneath it. The cause was found to be ‘gauge corner cracking’, a condition where tiny cracks in the rail develop over time due to the passage of trains. Replacement rails had been ordered, but had been delivered to the wrong location. Worse, however, was that the aftermath of the accident revealed that Railtrack had a completely inadequate knowledge of the state of its tracks. It didn’t know how many other cases of gauge corner cracking there were (as it turned out, a lot) and even when it found out, it couldn’t say with any degree of confidence which cases required urgent and immediate replacement of the rail, and which cases could be managed to allow replacement later. The solution Railtrack came up with was generally termed the “post-Hatfield meltdown” of the national railway network. Railtrack imposed swingeing speed restrictions at over 1,000 locations, and slowed trains to a virtual snail’s pace across the country. I can remember a trip from London to Newcastle taking about seven hours instead of the usual three during this period. At the same time, the upgrade of the West Coast Main Line had hit trouble. It turned out that moving block signalling wasn’t sufficiently well developed to allow its deployment on a major intercity railway, so it had to be abandoned, restricting Virgin’s new 140mph trains to a maximum of 125mph, at which they run to this day. Even this descoped project was now expected to cost far more than the original upgrade plan. In an effort to repair the damage and set the company on the road to recovery, Railtrack acquired a new chairman, John Robinson, who replaced Philip Beck (frequently referred to in the press at the time as ‘invisible’ during the post-Hatfield meltdown). It also bade farewell to its combative chief executive Gerald Corbett, replaced by Steve Marshall, who didn’t have the baggage that came with running Railtrack during two major accidents, snail’s pace trains, and out-of-control infrastructure upgrades. Railtrack was in trouble, but was desperate to show that it knew what needed to be done to put the railway network to rights, and protect its future. The design of its 2000/01 Annual Report was a clear illustration of its agenda. The previous year’s plain blue cover had shown contrition over Railtrack’s role in the Ladbroke Grove crash, but had arguably given the impression that events were driving Railtrack, rather than Railtrack taking charge of the situation. 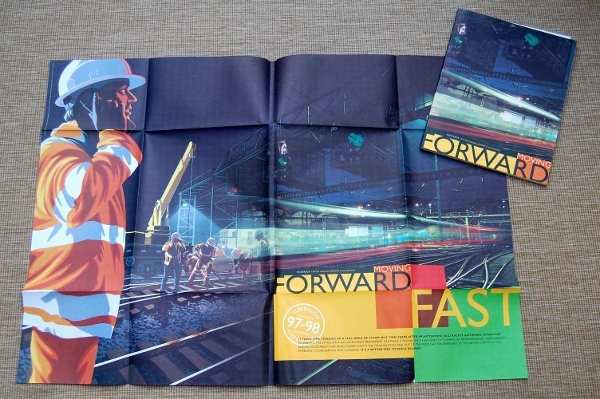 The 2000/01 cover portrayed Railtrack setting the agenda for the future. The photo illustration is of a route panel in a modern signalling centre. What better way of showing that Railtrack was setting a course for the future? Underneath is a stylised route map, the first destination on which is “National recovery plan”. I should think so too. Unfortunately for the company, Railtrack’s destiny was no longer in its own hands. In essence, thanks to the unexpected programme of repairs (mostly addressing inadequate preventative maintenance) which had become necessary after the Hatfield crash, Railtrack had run out of money. For the first time, the government had made money available to Railtrack directly, rather than channelling it through the track access fees of subsidised train operators. There was no other way of ensuring that all those speed restrictions were (slowly) removed as the track was replaced. Unfortunately, in a fantastically inept public relations move, Railtrack found something else to spend some of this new funding on rather than replacing track and lifting speed restrictions: paying a dividend to its shareholders. On the one hand, it wasn’t a surprise. That’s what PLCs with shareholders do. On the other, given the government’s fury with Railtrack’s apparent ineptitude, it was the sort of the thing that was only going to get the company into deeper trouble and put its future in greater jeopardy. I remember sitting next to John Robinson during the summer of 2001 on a press trip to see Virgin’s new Pendolino tilting train being tested, even though by that point we knew the trains would never run at their full potential speed. Robinson had grand plans for restructuring Railtrack for the future, and told me that the government’s transport secretary Stephen Byers was someone he could do business with while that plan was put in place. Even as a green reporter, I remember thinking that this was an astonishingly naive appraisal of the situation. Railtrack had thoroughly embarrassed the government (the whole country, really) and relying on the goodwill of a politician to let you carrying on doing things your own way, when you were in hock to the government, seemed brave to the point of recklessness. And so it proved in October 2001, when in a highly controversial move, Byers refused to give any further financial support to Railtrack, effectively making it insolvent. The government successfully sought a High Court order to put Railtrack into administration. It was all over. Railtrack carried on in administration, but the government had a clear idea of the kind of company that it wanted to take over the national railway infrastructure, and it wasn’t Railtrack. 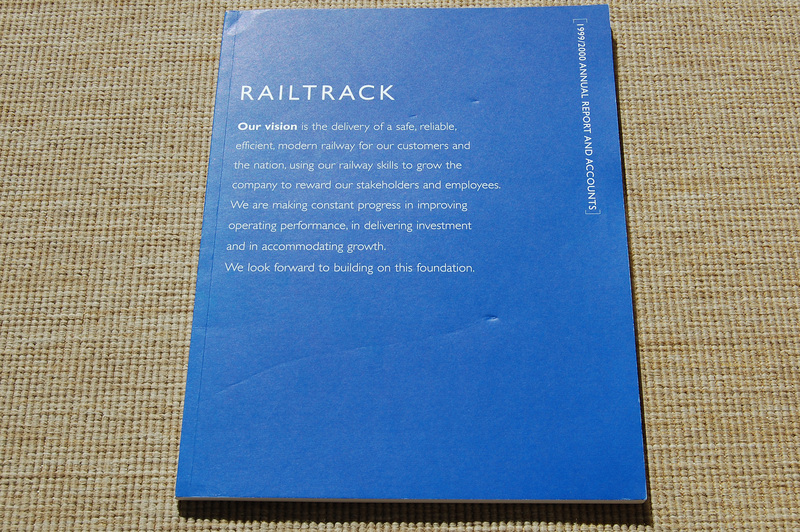 Railtrack’s parent company Railtrack Group, which owned a few other railway interests in addition to the in-administration Railtrack PLC, put out an Annual Report for 2001/02 but it was a sorry affair design-wise. The cover was white with black text (in Gill Sans) stating no more than the company name, document title and date of issue. There could be no clearer illustration of the depths to which the company had sunk. Although the parent Railtrack Group would soldier on for a few years seeking the best settlement it could achieve for its shareholders, Railtrack PLC would in 2002 be sold to Network Rail, a not-for-profit company limited by guarantee. Network Rail has a corporate identity of its own (detailed here), and even a typeface, the not-entirely-imaginatively-titled Network Rail Sans. It’s a somewhat more sober company than Railtrack, not beholden to the requirement to puff itself up in public to maintain its share price, and its graphic identity is a little more restrained too. That’s not necessarily a bad thing, but I doubt we’ll ever get anything as flamboyant as Railtrack’s early Annual Reports from Network Rail. It was fun while it lasted. I’m a regular reader but only just discovered this one. I for one would very happily see more two-parters! A really thorough, well-written and -researched piece about a fascinating part of our recent history.